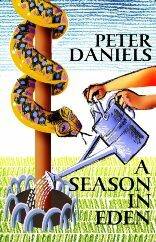 This book is advertised as a ‘second collection’, a surprise to those of us for whom Peter Daniels has been a familiar presence on the London poetry scene for many years. It turns out that the book has been compiled from several previously published pamphlets and the Acknowledgements page features a substantial list of magazines, anthologies, and competition successes. Sadly for some, his ‘obscene‘ Ballad of Captain Rigby is omitted. Daniels may not yet be a grizzled veteran, but neither is he the sort of ‘new kid on the block’ the Poetry Establishment (whoever you imagine they are) are always desperately seeking to promote. He is not Kate Tempest or Andrew Macmillan, excellent though they are. Since some new poets or musicians often have the same sort of things to say, that is no bad thing. Daniels has enough life experience, worldly knowledge and craft skills to make this book an enjoyable read. He sets his stall out by featuring the word ‘queer‘ twice on the back cover, while the cover art, featuring a tree of life entwined by a snake, while being watered, references the book’s title. The artwork is, I think, deliberately reminiscent of a childrens’ book, which might provoke an interesting classroom discussion. (Apologies to the artist if I got this wrong). So we are taken out of the library, the study, or the pub, and out for a bracing walk, before ending up back in Hackney, where as the narrator observes, ‘the Queen could reach me on the 73.’The next piece, ‘Faces’, takes us into Daniels’ Harry the Happy Paranoid mode; a character from his earlier work. Politics and social comment features throughout the book, for example in ‘Threshold’ – a poem of Audenesque or Orwellian ironies, where the more things change, the more they stay the same. ‘Blob Politics’ and ‘Dalston Junction’ where we are reminded that East London has been home to successive communities of incomers for a very long time, continue this theme. made you ask? You’re what you can do, I reckon. but for one Scottish great-grandmother to leaven the English. left Scotland and Judaism. Did that make him English? (should I ask him) wouldn’t: default position - English. Does this make Daniels a stateless person, or as Virginia Woolf, (I think*) said that as a woman, she was either stateless or a world citizen, or as someone described your reviewer, aged 14, ‘a rootless cosmopolitan’? The answer, to any civilised person, is made clear in this book, that Daniels is in some ways, not typical, certainly not ordinary, but a fine writer living a particular life in east London, sharing his insights in the poems gathered in this book. If there is a good bookshop near you, you know what to do.